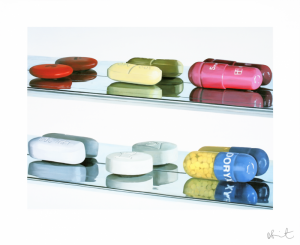 Originally produced to accompany Damien Hirst’s 2004 New York exhibition ‘The Elusive Truth’, Other Criteria has two of the artist’s ‘Pill Prints’ for sale. Focusing on a selection of Hirst’s over-sized hand-painted tablets, the medicine cabinet appears almost as a shrine or totem praising modern pharmaceuticals. However, while medicine helps to prolong life and prevent illness, it is ineffectual in holding off death completely. While Hirst’s pills remain shiny and inviting - immortalised as they are in the pristine pharmaceutical cabinet - the artist puts into question society’s reliance on chemicals to feel, and stay, alive.